Amazon has never been one to share the nitty gritty details about how the Kindles were developed, but today I have a treat for you. 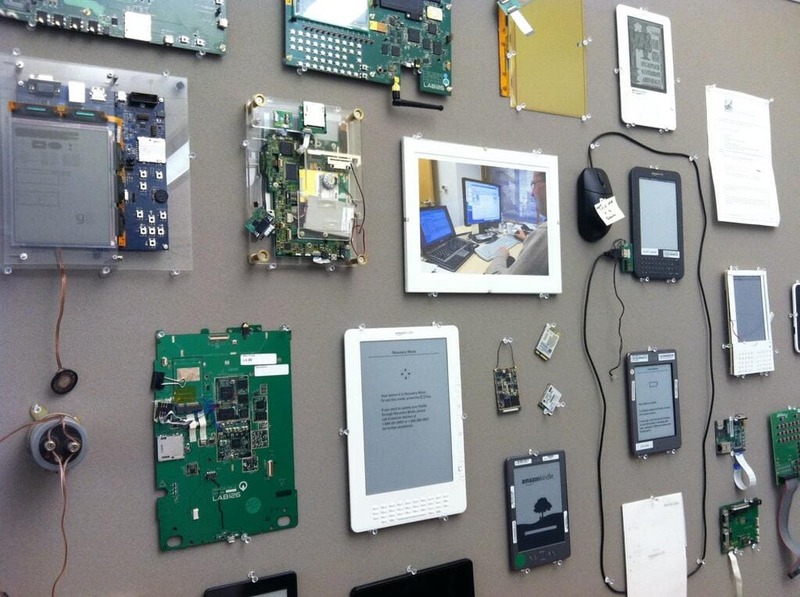 The Kindle team at Amazon shared a photo on Twitter and Facebook yesterday, and it shows a trophy wall of past Kindle prototypes. No explanation was posted with the photo so there's no way to tell exactly these components are, but we can take a few guesses. The original Kindle, K2, and other prototypes on the right are fairly self explanatory, though i do wish I knew why the K3 is wired to a white board which is wired to a computer mouse. In the center of the display are 3 f what looks to be wireless modules (3g or Wifi), and on the left are 4 development boards which may have been the very earliest prototypes. The rest of the items I'm not sure about. All in all, a very cool photo. If anyone at Lab126 cares to share more details, I am all ears. Think the color one is an early FIRE or a sneaky hint of things to come? Given the color quality and size I think the thing in the middle is a photo. But there might be a Kindle Fire along the bottom left edge. LOL. This is going to keep me giggling all day.